Here’s the finished Muscle Suit or as I like to call it, Exo-Suit. Due to the suit being pressed in to service for a last minute Halloween evening, I had to get at least a 90% finished suit together in under a week and this is what I ended up with! The Exo-Suit will need to be “polished’ a little here and there, to make it a bit more “pleasing” to the eye. 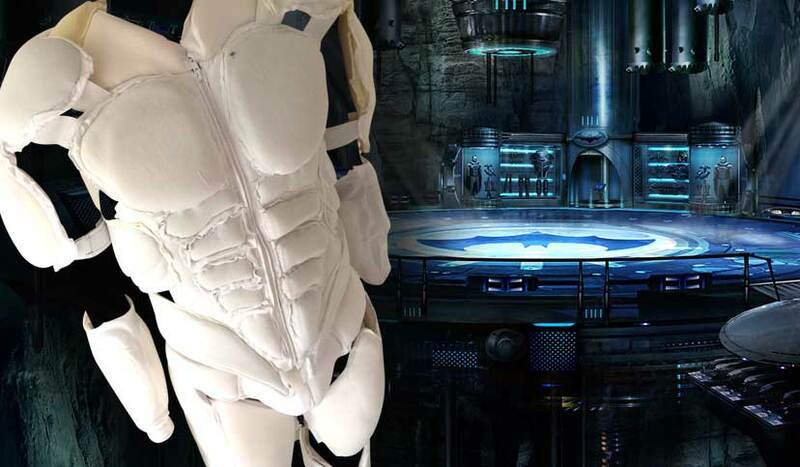 Even though it’s worn under the grey body suit, like everything that I’m producing for my own BATSUIT, I would like it to NOT look like the Exo-Suit has just been thrown together. Each of the arm and leg pieces are fitted using velcro, sewn to 1 inch elastic to allow for movement and the thigh pieces are connected to the torso using side release plastic buckle clips again on elastic so that they don’t slip down but again to still allow for movement. Amazingly the fit is pretty good and as nearly every piece of the torso is connected to each other using 1 inch elastic, each “muscle piece” can freely move with my own body. The first evening I wore the suit I was even able to drive whilst wearing it. I did do a quick test before, just to make sure my driving wasn’t obstructed in any way at all. I was able to wear the Grey body suit with the Exo-Suit underneath, belt and boots, comfortably and safely drive to the party and park, pull the cape and cowl on over my head and pop on the gloves. Then take quite a long walk to the Halloween party, with the cape flowing all around me, many pics were taken, but unfortunately few by me! I can’t wait for the next time!